after being replaced by coaches of the 3000-3199 series. July 23, 1930: Avenue C trolley service replaced by combined trackless trolley and gas bus operation on an experimental basis. The route ran along Cortelyou Road between Flatbush and Coney Island Avenues. It was decided to continue trackless trolley service and six additional coaches were purchased in 1931. May 27, 1932: 16th Avenue trolley service operating along Church, Gravesend, and 16th Avenues to 62nd Street was terminated at 16th and Gravesend Avenue and the line was renamed Gravesend-Church. Cortelyou Road trackless trolley service was extended from Coney Island Avenue through Cortelyou Road to Dahill Road and along 16th Avenue and 62nd Street to New Utrecht Avenue. October 31, 1956: Trolley coaches replaced with gas buses. August 24, 1947: Buses replace trolley cars. September 14, 1948: Trolley coaches replace buses between Boro Hall and Pennsylvania Avenue. May 1, 1954: Trolley coach service discontinued between Pennsylvania Avenue and Ralph Avenue. March 25, 1959: Trolley coaches replaced with gas buses. November 19, 1948: Trolley coaches replace buses. 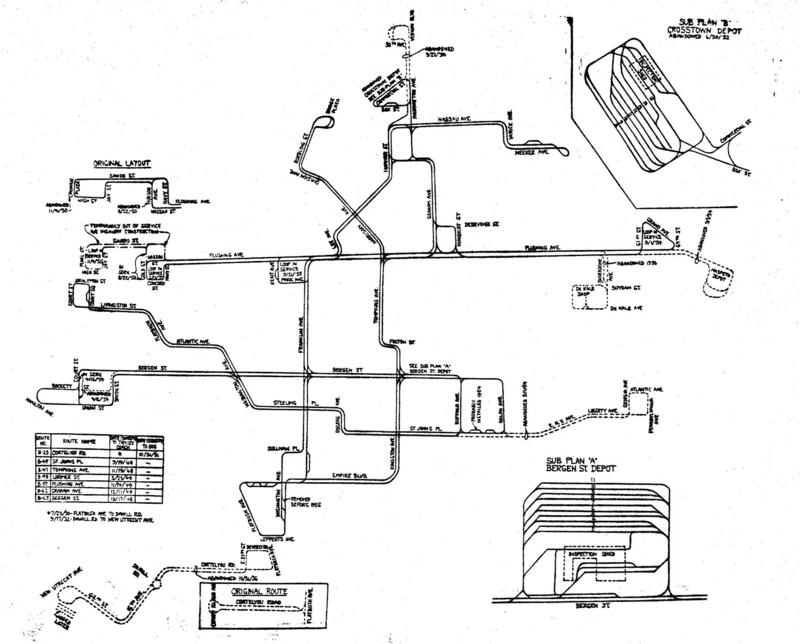 July 27, 1960: Trolley coaches replaced with gas buses. December 14, 1947: Buses replace trolley cars. March 23, 1949: Trolley coaches replace buses. November 21, 1949: Buses replace trolley cars. November 14, 1949: Trolley coaches replace buses. September 1, 1954: Terminus changed from Browne Place & Grand Avenue, Maspeth, to Flushing Avenue and 61st Street. September 21, 1955: Western terminus changed from Pearl and High Streets to Kent and Flushing Avenues. February 13, 1957: Western terminus changed from Kent and Flushing Avenues to Flushing Avenue and Navy Street. January 27, 1960: Western terminus changed from Flushing Avenue and Navy Street back to Pearl and High Streets. December 21, 1948: Buses replace trolley cars. December 11, 1949: Trolley coaches replace buses. September 22, 1954: Section between Box Street and Long Island City discontinued. September 21, 1955: Western terminus changed to Kent and Flushing Avenues. February 13, 1957: Western terminus changed to Flushing Avenue and Navy Street. January 27, 1960: Western terminus changed to Pearl and High Streets. July 20, 1947: Buses replace trolley cars. October 17, 1948: Trolley coaches replace buses.